HR&A advises city, state, federal, nonprofit and private entities as they develop projects across the northeastern United States that both promote recovery from Hurricane Sandy and make people, property and infrastructure more resilient in light of increasing hazards and vulnerabilities in the future. Our work includes contributions to the transformative visioning and community planning efforts of Rebuild by Design in Red Hook, the Rockaways, the New Jersey Shore, Hunts Point and Hoboken, delivery of the New York Rising Community Reconstruction Program, and capacity building within the National Disaster Resilience Competition, as well as feasibility analysis and project design for infrastructure and community development projects in New York and New Jersey, and groundbreaking studies of key resiliency issues such as flood insurance and incentives and tools for business adaptation. HR&A deploys creative approaches to public-private financing, policy change, and community and stakeholder engagement to improve projects and maximize their viability. Led real estate and financial analyses for the project, including preparation of a dynamic pro forma to test multiple alternatives. Created a funding strategy for barriers along Gowanus Canal and Newtown Creek that integrates both conventional and innovative infrastructure capital and O&M funding sources. Recommended actionable policy changes and mitigation strategies as responses to changing flood insurance costs for multifamily and mixed-use buildings. As part of a team led by Curtis + Ginsberg Architects, HR&A supported work on behalf of the New York City Housing Authority’s (NYCHA) Sandy Resiliency & Renewal Program in Coney Island. 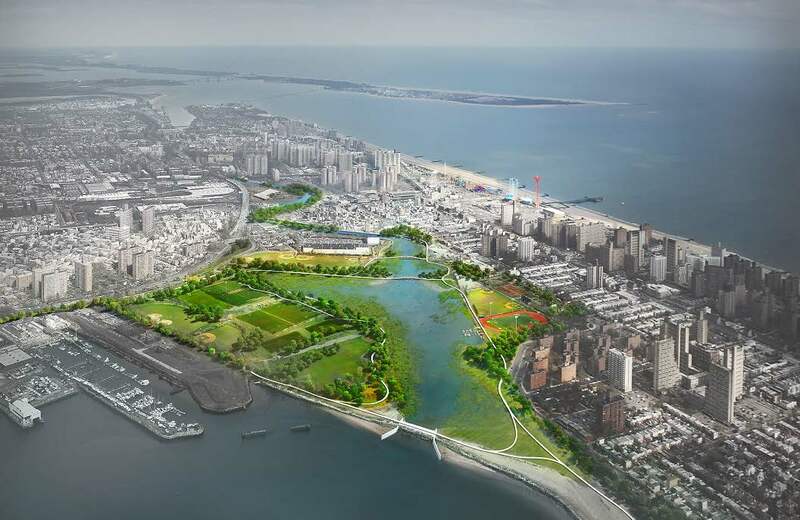 For three NYCHA developments in Coney Island, including O’Dwyer Gardens, Surfside Gardens, and Coney Island Site 8, HR&A collaborated with the team to identify potential uses for ground-floor space created by the development of new infrastructure on-site and other resiliency improvements. The results of the preliminary analysis informed the team’s broader basis of design and scope for comprehensive resiliency improvements across the sites, as well as NYCHA’s investment decisions with regard to the campuses. HR&A has led a number of other projects guiding the transformative visioning and community planning efforts taking place throughout the region. For the New York Governor’s Office of Storm Recovery, HR&A led a multidisciplinary team of engineers, architects, planners, and healthcare specialists through both rounds of the NY Rising Community Reconstruction Program. HR&A led or participated on three of ten finalists teams in the Rebuild by Design competition launched by the U.S. Department of Housing and Urban Development (HUD) to promote resilience for the Hurricane Sandy-affected region. From 2014-2016, HR&A was program manager for The Rockefeller Foundation’s Capacity Building Initiative in support of HUD’s National Disaster Resilience Competition.